Steps that higher education institutions (HEIs) can take to ensure they meet the expectations set out by the EPSRC. This guide suggests approaches to research data management (RDM) that will enable universities to meet the requirements of the Engineering and Physical Sciences Research Council’s (EPSRC’s) research data policy. We have included an overview of the EPSRC’s policy expectations, outlined particular implementation challenges and we offer some examples of how these have been addressed successfully. There are signposts to further resources and tools. This guide will be of interest to university senior managers and research data management support staff, including those who are responsible for giving advice to researchers on the storage, management, publication and archiving of research data. Research Councils UK (RCUK) has agreed seven common principles on data policy based on the common theme of access and reuse of research data and these principles underpin individual research councils’ policies, although the policies vary in their terms or specific requirements. The EPSRC’s policy includes nine specific expectations concerning RDM; they assign primary responsibility for promotion of research data management to the research organisation and require it to provide systems, tools and support services to enable this. 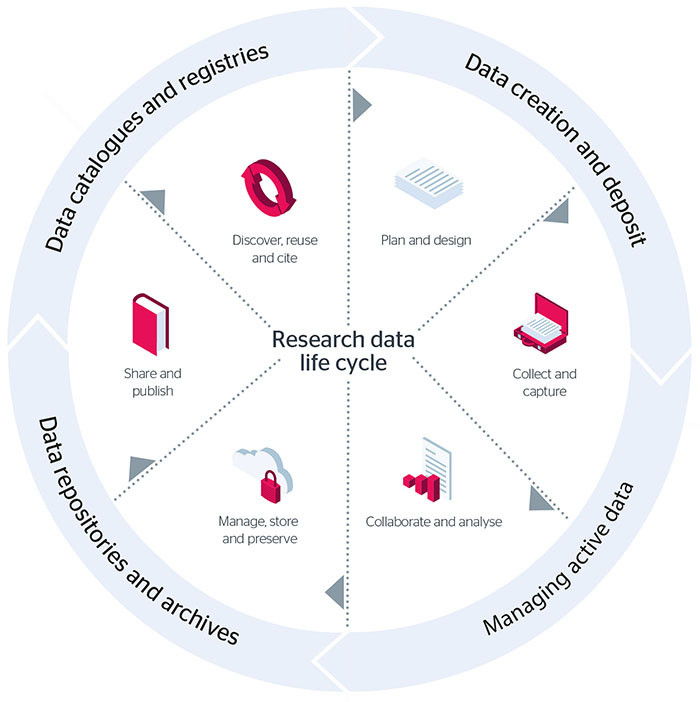 While the policy’s focus is on management of EPSRC-funded research data, it has had the wider effect of stimulating universities to think about RDM and the research data lifecycle in a way that goes beyond the requirements of a specific funder. This has inevitably thrown up a number of challenges for research organisations, especially with regard to resources: many are concerned about how they can plan for these and sustain them in the long term. The EPSRC policy framework was published in May 2011 and all research organisations in receipt of EPSRC funds were expected to develop a roadmap by May 2012, setting out how they would align their policies and processes with the EPSRC expectations. The Digital Curation Centre (DCC) offers a list of example roadmaps for review. The EPSRC expects full compliance with the expectations by 1 May 2015. The EPSRC has laid out clear expectations of organisations in receipt of EPSRC research funding. You can read these expectations in full on their website. To monitor compliance after May 2015, the EPSRC will ask pro vice-chancellors (pro VCs) for research to complete light touch self-assessment questionnaires and will start with dipstick testing after the summer break by checking availability of data underpinning published research for papers published after 1 May 2015. The longer term aim is to embed compliance checking through formal self-assessment and follow-up as part of regular dipstick visits by the research council’s audit and assurance services group. To meet the EPSRC expectations, higher education institutions (HEIs) need to coordinate their stakeholders, departments and processes so that, together, they can deliver the diverse elements of a cross-institutional research data management service. Institutions must explore the national and international services that could complement or replace local solutions. For example, international identifier systems such as ORCID and DataCite could be integrated into existing local research management systems. The recently concluded Jisc-ARMA ORCID project saw eight universities work through institutional ORCID implementation and we are now coordinating ORCID consortium membership for the UK. Institutions might also decide to make use of scholarly communications resources such as Thompson’s Data Citation Index to increase discovery of their data assets and demonstrate reuse. The range of institutional policies and practices that could address the EPSRC’s expectations will be determined by a university’s research profile, its culture, mode of governance and organisational structure. In some research areas subject repositories are well established so the scale of operation within the university will be influenced by this. The Cambridge Crystallographic Data Centre, for example, is widely used for crystallography data and journals require authors to submit crystal structures to this database. But where suitable subject-based data centres are not available, universities must ensure their research staff have access to effective systems and services for archiving and exposing the existence of their research data. The EPSRC expectations addressed here relate to institutional data management policies. They should exist for all data (principle V), and universities need to engage with their researchers and students to ensure that they are aware of the EPSRC’s expectations and the regulatory environment that is relevant to research data, as well as the way they can be shared (I). Where access is restricted the published metadata should give the reason and summarise the conditions which must be satisfied for access to be granted (VI). To manage their research data effectively, many institutions need to develop a formal policy. A policy will help to clarify both what is expected by the different stakeholders within the institution and also who is responsible for each activity. Policies will inevitably reflect local organisational realities and so it is no surprise that the early adopters of RDM policies have taken very different approaches. The University of Hertfordshire, for example, has extended an existing institutional policy to include data management so that it covers all types of data (corporate, administrative and research) and it also includes an appendix giving more specific guidance on managing research data and the importance of RDM planning. In contrast the University of Southampton has augmented its policy requirements with details of procedures such as responsibilities with regards to data management planning and links to further guidelines on issues like storage options. A list of existing university research data policies and a briefing paper describing how to develop such policies are both available from the DCC. Agreed guidelines, such as the UK Research Integrity Office’s Code of Practice for Research, outline common expectations for the collection, use, storage and retention of research data. Not all research data can (or should be) made openly available. Ethical issues, commercial confidentiality and licensing requirements might all restrict access. Researchers need to know when such conditions apply (also principles I&V) and universities must ensure that sensitive data, access requests and intellectual property rights (IPR) are correctly handled throughout th the research lifecycle. Legal obligations under the Freedom of Information (FOI), IPR, copyright, and data protection acts must also be taken into account when developing a data policy. The DCC guide on how to license research data explains the impact that licences have on future research and the potential pitfalls to avoid. Further resources include guidance on how researchers should respond when faced with an FOI request. Guidelines for managing data access must also be in place to determine the conditions of use that third parties must agree to before they can access data. There may be restrictions on the redistribution of data to third parties but access to commercially sensitive data, for example, could still be granted subject to a suitable non-disclosure agreement. The Wellcome Trust provides useful advice on data management plans (DMPs) in its guidelines for researchers. This explains the value of anonymising and aggregating data, as well as the role of data access committees to manage access to more sensitive material. Ensure the RDM policy or guidelines address the issue of preservation: who decides what is worth keeping? How long for? And how? The EPSRC expects that research organisations will allocate adequate resources from their existing public funding streams to support the management and curation of research data (IX). Research data are valuable assets created by universities and maintained within them; carefully costed plans should be put in place to care for these assets in the long term. Capital and revenue budgets must be found and allocated, just as they would for any other core service. For many universities the lack of certainty about what it will all cost is a major problem. Perhaps the most challenging issues are knowing how much storage to budget for and how readily (and how soon) researchers will deposit their datasets. These unknowns make it difficult to build up an evidence-based business case. As well as semi-variable storage costs there are initially some fixed costs to take on board, including the employment of staff to facilitate the RDM development process. Our keeping research data safe projects found that staff are the major cost component overall and that there is a minimum base level of staff cover, skills and equipment required for any service; the keeping research data safe factsheet is a useful resource. Initial outreach, acquisition and ingest have high costs and the cost of access to data through retrieval costs and bandwidth is also significant. Archival storage and preservation represent a very small proportion of the total. Ingest automation and leveraging shared services and economies of scale should help to reduce these costs for universities over time. The UK Data Service’s costing tool and checklist helps institutions think about the resources they need when setting up a data service and RCUK funders have provided further clarifications on specific allowable RDM cost elements following a research data management forum event on funding RDM. Many universities have made an internal business case to secure core funding to establish and run their RDM services and are defining a basic level of support provision over and above which charges may be applied. The University of Bristol has published storage costs so that researchers can include any additional charges in their grant applications. Useful examples of costing models for digital preservation and data curation can be found at the Open Preservation Foundation and we have included examples of storage estimates and some default allocation quotas in the final section of this guide on active research data storage. The Jisc co-ordinated 4C collaboration to clarify the costs of curation project has developed the Curation Cost Exchange (CCEx) tool for digital curation staff to submit and compare costs of curation. The tool helps staff understand curation costs and also how they can use cost models to make suitable investments in curation. Organisations can also submit their curation costs to the tool to analyse and compare their own costs against those submitted by similar organisations, helping them to make informed decisions around curation investments. Universities are taking different approaches to recovering costs for storage and preservation of data. Some see this as core business and fund their research data management activities out of core funding. Others adopt cost recovery models that are triggered by individual data deposits. The University of Bristol uses a system modelled on the Princeton ‘Pay Once, Store Forever’ (POSF) model, which calculates a one-off charge for data storage that covers future refresh of the media by applying Moore’s Law to storage costs. The university has defined ‘forever’ in this context as 20 years. In contrast, The Bodleian Library at Oxford has established the University’s institutional data repository, ORA-Data, as a small research facility, to enable researchers to include the cost of archiving and storing data into grants in a way that is acceptable to funders. The ORA-Data cost model will be revised regularly as the service matures. As pointed out above, research organisations are expected to promote the EPSRC’s research data management principles to researchers and staff (I). This is expected by the EPSRC to be an ongoing part of the normal business of organisation-based training. Our managing research data programme found that when developing training materials it is essential to collaborate closely with academic departments to create effective discipline-focused materials. The EC-funded FOSTER portal is a useful place to locate training content on open science more generally. Because data is part of the essential evidence base of a scholarly article, the EPSRC (and RCUK) principles on research data state that sufficient metadata should be recorded and made openly available. This enables other researchers to understand the potential for further research and reuse of the data. All published research papers should include a statement describing how and on what terms any underlying datasets may be accessed. Just as other research that is used in a scholarly article should be cited, so should any datasets that are drawn upon to substantiate the published findings. Statements on how the underlying data can be accessed can take many forms, ranging from contact details to request access, to URLs and full citations. It is preferable not to direct potential future users to a personal email address as these change regularly and can be unreliable. The EPSRC recommends that each dataset has a unique identifier which can be cited. Citations must provide the reader with enough information to access the dataset. If the data cannot be made directly accessible, the data citation should contain a persistent link to a separate document or landing page containing the associated metadata so that a future user can understand the potential value of the data and gain access under certain conditions if possible. Examples of suitable citation formats are available from a variety of sources including DataCite and the DCC. National disciplinary data centres such as the UK Data Service provide advice on data citation for their sectors. The University of Bristol offers examples of data access statements that may be suitable for external datasets that might not be publicly available. Policies and plans are expected to be in place for all existing projects (principle V). Data management planning is the process of planning, describing and communicating the activities carried out during the research lifecycle in order to keep research data safe, maximise its reuse potential and to support its longer term preservation. Researchers and institutions will benefit from support and services for planning activities especially before research data is created and collected. The DCC has worked closely with research funders and universities to produce DMPOnline, a tool that assists researchers to produce an effective DMP for the whole project lifecycle. It offers several templates representing the requirements of different funders (including one for the EPSRC) and universities. Users are asked a number of questions at the outset to determine the appropriate template to display and guidance is provided by research funders, universities and disciplines to help researchers interpret and answer the questions. Several universities have customised the tool to point to relevant institutional policies such as guidelines on research ethics and information about ethics committees on their RDM web pages. The EPSRC expects data management plans to be in place and the template can help researchers and institutions to address specific expectations. The EPSRC also expects research organisations to put policies and processes in place to identify their research data assets and the risks to these (III). It’s ultimately up to researchers to decide which data to keep but they may need support to make this judgement. What is judged relevant will vary by discipline. It’s ultimately up to researchers to decide which data to keep but they may need support to make this judgement. In the case of published research, what to keep should be informed by consideration of what people would need if they were seeking to validate or reproduce the results or to check the underpinning evidence used to support the findings. If the research data does not support published research findings then it’s again up to the researcher to decide what to keep, informed by their best assessment of the likely future value of the data. The DCC has a guide that addresses issues such as assigning responsibility for appraisal and how to create an appraisal and selection policy. It has also developed a useful checklist for appraising research data. The EPSRC policy expectations being addressed here (IV, V and VII) relate to the appropriate storage of publicly-funded data and maintaining a record of holdings to facilitate access. Research organisations should ensure that data is not held in any jurisdiction where the legal safeguards provide lower levels of protection than are available in the UK. Moreover, non-digital data should be stored in a manner to facilitate it being shared in the event of a valid request for access. These requests for access should be tracked as this affects the period for which the data should be preserved. The EPSRC expects data to be securely preserved for a minimum of ten years from the end of embargo or, if others have accessed the data, from the last date on which access to the data was requested by a third party. One way in which access requests could be monitored is via an institutional data catalogue. Research organisations are expected to publish metadata describing the research data they hold. The EPSRC recommends what should be included in this metadata and expects that it will be freely available online within 12 months of the data being generated. As EPSRC policy expectation VIII requires effective data curation throughout the lifecycle, services must be made available during the data collection, capture, interpretation and analysis phases. This could be termed ‘active research data storage’ where data is work in progress and therefore subject to change; a high amount of collaboration and sharing is often needed. Given the high levels of use of third-party cloud services such as Dropbox, Google Drive and Microsoft OneDrive amongst the research community, one of the key challenges to address is ensuring researchers have enough research data storage and flexible mechanisms for sharing with collaborators. Responses to the use of cloud services have been varied. Some institutions, such as the London School of Economics and Political Science (LSE), have provided pragmatic guidance on when it may be appropriate to use cloud services and for what kinds of data. Others have provided in-house alternatives by piloting open source tools such as OwnCloud or trialling the use of corporate solutions such as SharePoint for data. We have also secured a deal for the sector to offer file sync and share services. This will allow institutions to purchase third party solutions at a preferential rate and gain some assurance that data is held in the European Economic Area (EEA) for data protection purposes. ‘all reasonable steps will be taken to ensure that publicly-funded data is not held in any jurisdiction where the available legal safeguards provide lower levels of protection than are available in the UK’. This may rule out Dropbox and Google Drive as data is often held on US servers, but Microsoft OneDrive and Amazon Web Services, through Jisc-negotiated agreements, both offer storage on EU-based servers to institutions. The geographic location of data is even more important when it comes to sensitive material such as health data, which can be restricted to a specific part of the UK. In terms of storage, more work needs to be done by institutions to identify storage requirements for capacity planning. Several universities have carried out surveys to help determine the scale of current holdings and likely growth rates. The results of this work at the University of Hertfordshire led it to allocate 50GB per researcher as a default offer. However, the institution also established an RDM triage system with the PI for each new funded award and up to 5TB will be allocated on the basis of need. Other universities are providing differing quantities: at the University of Edinburgh each researcher is allocated 0.5 TB although this can be pooled by groups; the University of Bristol offers 5TB per ‘data steward’– a nominated data management contact, usually a PI; and the University of Manchester provides 20 TB per project, allocated only on completion of a compulsory DMP. Further examples are provided in the DCC’s briefing from its 2014 RDM survey. Most universities provide details of charges so that any requirements above the quota can be costed into grant applications. The storage of paper records related to research has arguably been less well addressed. Some institutions have considered using corporate records management stores for data, while others are looking at routine digitisation of known classes of physical records such as lab notebooks. The EPSRC policy requires data to be stored in a way that allows retrieval and provision of access. Recording non-digital data in the institution’s catalogue and digitising it on request would be sufficient. When data becomes a ‘finished product’ and can be used to support research findings it needs to be moved from active storage into a repository. Here, discovery metadata is created for the dataset, an identifier (such as a digital object identifier [DOI]) is assigned and the data (or metadata where access restrictions apply) is published. At this point the researcher and institution must select the appropriate publication space, which won’t always be the university repository. It might instead be one of the numerous national and subject specific repositories or the data may have a publication location mandated by a journal publisher or research funder. A comprehensive list of data repositories can be found at re3data.org. Research Data Oxford has provided a data decision tree for EPSRC funded researchers in order to find a suitable data publication space for their data. The EPSRC has specific requirements around the provision of metadata for research data holdings. Sufficient metadata should be provided to allow others to understand what research data exists, why, when and how it was generated and also how to access it. A robust digital object identifier should also be assigned. There are several types of persistent identifier that could be used to identify datasets: examples include Handle, Archival Resource Keys (ARKs) and Persistent URLs (PURLs), all of which can be resolved to an internet location. Arguably the scheme that is gaining most traction is the Digital Object Identifier (DOI). The creation of a DataCite DOI necessitates a minimum amount of metadata such as the data creator, publisher, the publication year and the title of the dataset, and there are several other optional fields that can enhance the discoverability of the data through the DataCite search API. The additional identifier fields are useful to enable interoperability between other identifier systems such as ORCID for researchers and can be useful to create machine-readable links to publications, which can help to track the impact of research data. Several universities have been developing data registers or catalogues. The University of Oxford had developed a stand-alone data discovery tool, DataFinder, as part of the Jisc-funded DaMaRO project, but in order to make their data services more user friendly this has been replaced with an integrated data repository and catalogue service, ORA-Data. The new service offers a single point of deposit, discovery and access for users, and enables researchers to create rich metadata about their data to ensure it can be understood and reused. Work has also been done by the UK Data Service to define core metadata based on Dublin Core, DataCite, Data Documentation Initiative (DDI) and Inspire standards and this has led to the development of the ReCollect plugin for e-prints repositories. Other institutions are using their research information management systems to store the metadata. The University of Lancaster has decided to use Pure as its data catalogue, while Loughborough University is using Symplectic. We will continue to collaborate with the DCC and the UK Data Archive to develop a research data discovery service. The first phase of this work trialled the feasibility of the Research Data Australia catalogue, harvesting data from nine universities and three data centres, developing a number of metadata crosswalks and engaging with stakeholders to understand their requirements. The second phase of work (November 2014 – July 2016) is exploring stakeholders’ requirements, piloting alternatives such as CKAN and laying firm foundations for a discovery service, including a service operation plan and a business case for its delivery into the future. The EPSRC also expects that research organisations will ensure that effective data curation is provided throughout the full data lifecycle (VIII). This implies that the full range of responsibilities associated with data curation over the data lifecycle will be clearly allocated within the research organisation and where research data is subject to restricted access the research organisation will implement and manage appropriate security controls; research organisations will particularly ensure that the quality assurance of their data curation processes is a specifically assigned responsibility. As the diagram below indicates, digital curation involves a number of activities that span a range of stakeholders. The creation and active management of data in the short term will be primarily a concern for researchers, though naturally they will draw on support and services from others. Digital preservation and any associated transformations such as migration will be the responsibility of institutional repositories and data centres who act as long-term stewards for the data. Other activities such as making content available are shared responsibilities that require significant input from service providers and the researchers who understand the data best. Clarifying roles and responsibilities and establishing sound workflows for the key points of interaction are key. The EPSRC expectation that data will be preserved for ten years is similar to those of most other funders. What differentiates the implementation of the EPSRC requirement is determining the point at which the ten year period begins. This is either the point at which data first becomes available after any period of privileged access expires, or the last date on which access was requested by a third party. Records managers have not always been involved in RDM working groups, but their experience of monitoring access and managing retention periods will prove invaluable in dealing with the EPSRC requirements. Systems are needed to enable usage to be tracked and to alert the data service as to when data can be removed. Data may be reviewed to determine whether it still needs to be kept or if it should be disposed of as the ten year period elapses. In terms of data archiving, the University of Edinburgh has undertaken a useful analysis of the functionality needed in a ‘vault’ service. Some institutions are operating their own data back-ups using offline tape storage and hierarchical storage mechanisms. Many others have chosen to outsource data archiving to Arkivum, an approved contractor with whom we have signed a framework agreement. There are several factors to consider when outsourcing long-term storage, not least additional egress charges (costs attached to data retrieval and download) and any fair use policies that may be applied. It is important to try to model expected patterns of use and to understand the full cost of outsourcing before deciding which is the best option. Naturally, alternative homes may be available for a range of data via subject data centres and community initiatives. Most institutions recommend that researchers place their data in a subject repository if one is regularly used by their community, or the institutional repository if not. There are many aspects to address when establishing RDM support services so a phased approach to development is recommended. The challenges faced will vary by institution based on the existing infrastructure, research environment and prevailing organisational culture. Attention needs to be paid to the local context to determine the best starting point. Securing the buy-in and support of others is critical. RDM requires the input of all university services; aim to convene a broad-based working group with the backing of senior research leads and the academic community. Input from a wide-ranging group should also help to ensure work is continued when staff leave or move on to new posts, and that the services developed meet the diverse needs of the research community. We are continuing to support the implementation of RDM solutions for UK universities through research at risk which aims to develop shared infrastructure, services and advice, and through our support of the DCC which provides a number of useful resources, in particular the how to develop RDM services guide. We are continuing to support universities with EPSRC compliance as part of research at risk. For example a workshop was run in February 2015 and a series of case studies focused on particular university approaches have been developed. Visit the research at risk project page. With a view to sharing solutions and lessons learned across the higher education sector we have examined activities and experiences within four UK universities – the University of East London, the University of Edinburgh, the University of Leeds and the University of St Andrews – as they meet the expectations in the EPSRC research data policy framework. Information was collected through semi-structured qualitative interviews with selected RDM staff at each of the four universities. Some of our interviewees also consulted with the wider RDM team in their institution to answer the interview questions. While the EPSRC policy’s focus is on management of EPSRC-funded research data, it has had the wider effect of stimulating universities to think about RDM and the research data lifecycle in a way that goes beyond the requirements of a specific funder. The RDM services at the study participants’ institutions have been developed holistically. In the interview summaries we describe how the four universities have each planned and implemented their RDM services and processes and also indicate how the service elements address specific EPSRC requirements. Thanks is due to Ben Ryan, Engineering and Physical Sciences Research Council (EPSRC); Rachel Bruce, Jisc and John Shemilt, Imperial College and Russell Universities Group of IT Directors (RUGIT) for their useful comments on an early draft of this guide. Thanks also to John Kaye, Jisc for his useful comments and contributions to section I business planning and section II. For the case studies, many thanks are due to Stephen Grace (University of East London), Stuart MacDonald (University of Edinburgh), Rachel Proudfoot (University of Leeds), and Anna Clements (University of St Andrews) who contributed their time and expertise to this report. Thanks also to Sarah Jones at the Digital Curation Centre (DCC), who made valuable comments on an early draft. The Digital Curation Centre, provided by Jisc, provides expert advice, practical help and resources to anyone wanting to store, manage, protect and share digital research data in UK higher education and research. Sarah is senior institutional support officer for the Digital Curation Centre. Monica is institutional support officer for the Digital Curation Centre. She was one of the authors for the case studies which accompany this guide. Jonathan is institutional support officer for the Digital Curation Centre. He was one of the authors for the case studies which accompany this guide.